This year, Chinese New Year falls on Friday 16th February. It is the Year of the Dog, according to the Chinese zodiac, and is the grandest and most important annual event for Chinese people. Chinese New Year has more than 4,000 years of history behind it. The date of it changes every year, because it follows the lunisolar calendar, based on the movement of the sun and the moon. Usually, it falls on a day between mid-January and mid-February. Chinese New Year is also called the Spring Festival. This is because it tends to fall after the solar term, which marks the beginning of spring (Li Chun). As a traditional festival, Chinese New Year is a time for the whole family to get together, much like Christmas Day is in Western cultures. The Chinese hold a family reunion dinner on Chinese New Year’s Eve, which is a big feast to commemorate the past year. Fireworks are an indispensable part of the celebrations and all families have them. Just like at Christmas, children have an especially good time. They wear new clothes and instead of receiving wrapped presents, their relatives give them red envelopes stuffed with money, which they’re allowed to spend as they like. Chinese New Year is the longest Public Holiday. Most employees in China have at least seven days off work, including three days’ legal holiday, while students take one month off school. The celebration lasts for 15 days from the 1st to 15th day of the first lunar month. No matter where they are, people try their best to return home for a family reunion. Families often travel together during the holiday, which leads to the world’s largest annual migration, known as the Spring Festival Travel Rush. Houses are decorated with red couplets, red lanterns, and red paper cuttings. City streets are lit up by red lanterns and people dress in special red clothing. In Chinese culture, red is the symbol of happiness, wealth and prosperity. It can ward off evil spirits and bring good luck. These red decorations are to the festival what Christmas trees are to Christmas. Originating during the Shang Dynasty (17th – 11th century BC), the festival used to be observed to fight against the monster, Nian, who liked to eat children, crops and livestock. The monster was afraid of the colour red and loud noises. Therefore, people decorated their houses in red and set off firecrackers to expel it. According to ancient Chinese legend, there was a ferocious monster named Nian with sharp teeth and horns. Nian lived in the depths of the sea, but at the end of each lunar year, the beast would rise up from it’s gloomy home and and go hunting on land for people, crops and livestock amongst the villages on the coast. Each year, the villagers would escape to the remote mountains to try to avoid Nian’s attack. One year, just as the village was about to leave for their mountain refuge, they were joined by an elderly beggar. He was gnarled and bent, with silver hair and piercing eyes, and he walked with the help of a stick. Everyone was in such a rush to leave that no one paid any attention to the old beggar. At last, an elderly lady from the village approached the old man and gave him some food. She explained to him the annual terror they suffered from the Monster Nian and persuaded him to flee with the rest of the villagers. But the old man remained calm, smoothed his whiskers slowly and asked to stay one night in the old lady’s house. He promised to expel the beast in return. The old lady wasn’t convinced but the beggar persisted, so she granted him permission and fled to the mountains with the rest of the village. Just as the clock struck midnight, the monster bounded into the centre of the village. Now normally the village would be in total darkness, but this time one house was brightly lit up with candles and the doors and windows were covered with red paper. This was disconcerting, but Nian pressed on and approached the door. Suddenly, a loud cracking sound erupted from the courtyard. The front door burst open and the old beggar man walked out wearing a red gown and roaring with laughter. Nian was terrified and fled into the safety of the night. The next day the villagers returned and were surprised to find their village exactly as they’d left it. The old lady told them of the beggar’s promise to her and they flocked to her house to find out what had happened. Like Nian, they discovered the doors and windows covered in red paper, the house brightly lit up with candles and some burnt bamboo in the courtyard. The elderly beggar explained what he’d done and the villagers understood that the colour red, bright lights and the cracking noise of burning bamboo were the keys to scaring the monster. To celebrate their triumph over the monster, the villagers dressed themselves in new clothes and visited their neighbours to share their joy. The news spread and soon everyone was adopting the same measures to frighten off Nian. So today, people paste red paper couplets on their doors, wear new clothes (often in red), light candles, lanterns and lights and let off fireworks to ward off evil spirits. Chinese New Year is also called Guo Nian, which means ‘surviving Nian’. Chinese New Year Food is nothing if not abundant. Every dish has its symbolism deeply rooted in Chinese culture. Different kinds of foods have different meanings, which express people’s good wishes for a new year. Some of the most popular foods are detailed below. Chinese Dumplings now enjoy worldwide popularity. Its history can be traced back to the South and North Dynasty (420 –589) and it’s popularity continued during the Ming (1368 – 1644) and Qing Dynasties (1644 – 1911) in North China. Dumplings are often eaten at midnight to symbolize the changing of the year. The shape of the dumpling resembles the Chinese tael, a part of the Chinese system of weights and currency. It symbolizes the hope of forthcoming wealth and treasures. Dumplings are stuffed so people often put auspicious materials inside. In some areas, a coin is placed inside in the hope that whoever eats it will become wealthier. These days, dumplings are a major food on Chinese New Year’s Eve and the first meal on the first and the fifth day of Lunar New Year. Fish is an indispensable dish at the Chinese New Year Dinner, because Chinese people give it many kinds of meanings. Fish has its Chinese pronunciation as Yu, which means having more than just a basic need each year. In southern China, some people just eat the middle part of the fish on New Years Eve, leaving the head and tail to the next day to symbolize completeness. In China, there is a blessing speech called Nian Nian You Yu, which means may you have surpluses and bountiful harvests every year. Chinese New Year Dinner or Reunion Dinner, is large and sumptuous and includes meat, fish and all kinds of vegetables. The number of dishes is also important, being six, eight or ten. This signifies becoming prosperous and respectable. Nowadays more and more people choose to have the Reunion Dinner in restaurants instead of cooking at home. Rice Dumplings (Yuanziao) Since the Song Dynasty (960 – 1279), people have been eating rice dumplings for the Lantern Festival, because their round shape is the symbol of family reunion. People in the north and south of China have different customs involving rice dumplings and the way they’re made also differs. In the south, the rice dumplings are called tangyuan. They’re made similarly to traditional dumplings. A dough is made first and then wrapped around the stuffing, which may be bean paste, brown sugar and all kinds of fruits and nuts. In the north however, the rice dumplings are called yuanxiao and are made slightly differently. Spring Rolls were first eaten on the fourth day of February in the Eastern Jin Dynasty (317 – 420). Fresh vegetables are wrapped inside and people eat them to welcome in a new spring season. Now they have also become a dessert in some places at the Reunion Dinner, which sometimes contain people’s wishes to welcome a new beginning. Laba Congee is a ceremonial dish eaten during the Laba Festival. It includes different kinds of rice, ormosia, dates, peanuts and melon seeds. It originated from Buddhism, in which the congee was only served for the Buddha. In the Ming and Qing dynasties, people sacrificed laba congee to their ancestors or sent it to relatives as a blessing. The emperors would bestow the congee on their ministers as well as on temples and Chinese people sacrificed the laba congee to the Five Cereals Gods. These kinds of ceremonies have now disappeared, but the custom of having laba congee remains. Nian Gao (rice cakes) is traditionally eaten to celebrate the New Year. The Chinese pronunciation of rice cake as niangao, is a homophone for a word meaning a higher level of life. Niangao is made of glutinous rice powder and can be cooked by frying, steaming, stir-frying or boiling. Zongzi. Throughout China families will eat zongzi to memorize the national hero, Qu Yuan, who ended his life by drowning in the Miluo River on hearing his state had been defeated. Zongzi are pyramid-shaped dumplings made of glutinous rice, wrapped in bamboo or reed leaves, often made into sweets with dates. However, it can be either sweet or savory and made from a great variety of ingredients, such as meat, shrimp, bean paste and nuts. Chongyang Cake. Climbing mountains is a popular custom in China during the Chongyang Festival, symbolizing promotion to a higher position. However, where a mountain isn’t available, people eat goa instead, which are cakes of rice or bean powder. In the past, newly married daughters would go back home to spend the festival together with their parents, so the cakes were decorated with Chinese dates, millet, almonds or peanuts, signifying the parent’s good wishes for their daughters to give birth to a child in the near future. 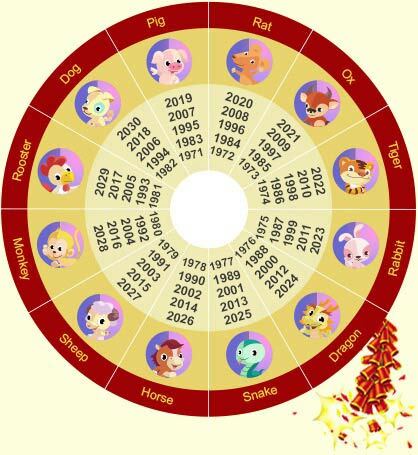 The origins of the Chinese Zodiac and the order of the animals are based on Chinese legend. Each animal represents certain human characteristics, much like western astrology, and many people continue to use it as a way of determining who would be the best person to marry or to work with. Every zodiac sign also corresponds to a city in China, according to the characteristics of that city. For example, Beijing is linked to the tiger. If you’d like to read about the legend, visit the website at https://www.chinahighlights.com/travelguide/chinese-zodiac/story.htm. Here are some fun facts about people who are born in the year of each animal. If you want to find out which year you were born in, visit this website https://www.travelchinaguide.com/intro/social_customs/zodiac/.